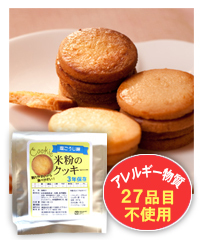 “Rice Cookies” is made from rice that produced in Niigata.Niigata is a famous town in Japan of producing a good quality rice. It’s also a place where a lots of natural disaster occur, so people have been looking for ways to survive and continue living with their families on that land that produces some of the finest Rice Brands in Japan. This is how the idea of “Rice Cookies” was born. some of the heads of local producers of rice in Niigata with the help of one of renowned patissier chefs came up with the idea of producing a healthy and delicious rice cookies that anyone can eat “Barier Free”, seniors,kids,even people with allergies. Since then Niigata people have found one way to help them survive and get through difficult times in emergency situations. Also producing such a product has given a boost to the local rice farmers to increase the sales of rice. 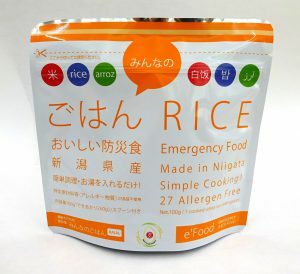 Since our helthy “Rice Cookies” has been introduced to the Japanese market, the government was interested to put extra large orders to our company to be ready incase of emergency situations to help human life survive in both Japan and abroad if necessary. Alpha rice is packed in pouch and very useful for disaster cases. Even without gas or electricity, it can be cooked with hot water or water! We are producing rice in Niigata. The Chuetsu Earthquake that occurred in October 2004 was a very shocking disaster for us. Among the evacuees there were many people put upon restricted diet such as those with difficult chewing, food allergy, artificial dialysis patients.For that reason, they could not eat Koshihikari that we made without using pesticides, chemical fertilizers.And in Japan that has an aging population, such people will increase. Meanwhile, we thought that our mission is to make rice everyone can eat safely. Copyright 2010-2019 © エコ・ライス新潟 All Rights Reserved.